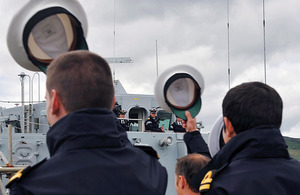 Royal Navy minehunter HMS Bangor left for the Mediterranean yesterday to relieve HMS Brocklesby in supporting NATO forces off the coast of Libya to enforce United Nations Security Council Resolution 1973. Due to recent events in the Mediterranean, in particular around the coast of Libya, the UK has been requested by NATO to keep one mine countermeasures vessel on station in this area. We have been working long and hard in preparation for operational deployment and are proud to be playing an important role helping to enforce UN Security Council Resolution 1973. Since Christmas, HMS Bangor has been put through her paces on operational sea training in preparation for a deployment with the Standing NATO Mine Countermeasures Group 1 to the North Sea, which had been planned for later this year. 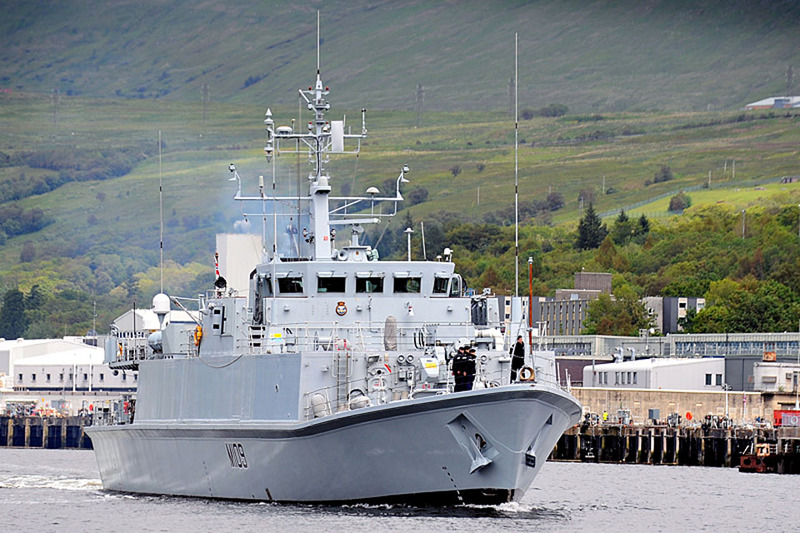 HMS Bangor has also completed a major maintenance period, gearing the ship up to sail from UK waters for six months. Built of glass-reinforced plastic, HMS Bangor’s design ensures that the ship is extremely quiet and has a very low magnetic signature, essential when operating in a minefield. Equipped with the latest precise navigation and manoeuvring systems, which allow her to ‘hover’ over a fixed point and search for mines with a variable depth sonar - capable of detecting ordnance at depths in excess of 200m, Bangor can also deploy her clearance divers or advanced submersible to deal with mines or suspicious objects. HMS Ocean launched her embarked British Army Apaches again on Saturday, 4 June; this time against a multiple launch rocket system positioned on the Libyan coast near Brega. The attack helicopters used Hellfire missiles to destroy their target before returning safely to the ship. As before, these missions were supported by other NATO aircraft, including RAF Sentry, Sentinel and Nimrod surveillance aircraft, and VC-10 tankers. Also on Saturday, RAF Tornados joined other NATO aircraft in a major strike on a large surface-to-air missile depot in Tripoli, attacking eight targets within the complex. And yesterday, Monday 6 June, RAF ground attack aircraft struck the headquarters of Colonel Gaddafi’s military intelligence service in Tripoli. Since the start of military operations to enforce UNSCR 1973, Royal Navy, Royal Air Force and Army Air Corps assets have successfully attacked over 410 regime targets involved in Colonel Gaddafi’s persecution of the civilian populace.